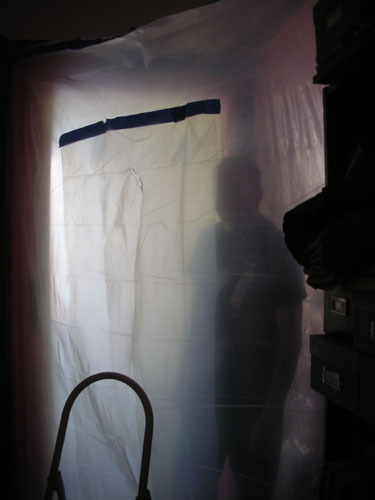 We set aside today to do the asbestos abatement. 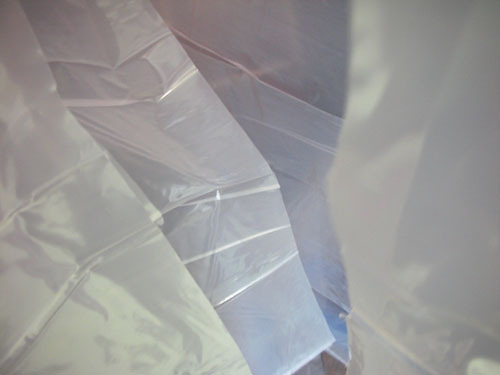 So after breakfast, we got to draping things with plastic. 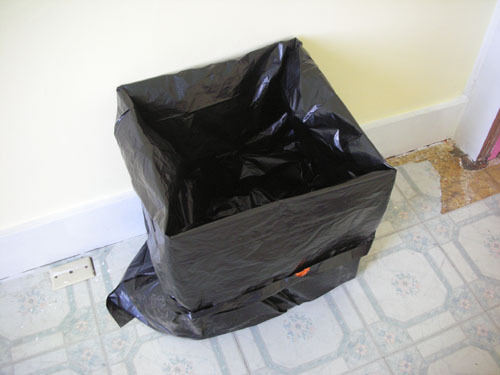 The idea is to contain any possible errant asbestos fibers in the plastic. The light switch and electrical outlets were also covered, because they had gaps. And then Noel constructed a cute little plastic antechamber in case we needed to leave the room during our work. 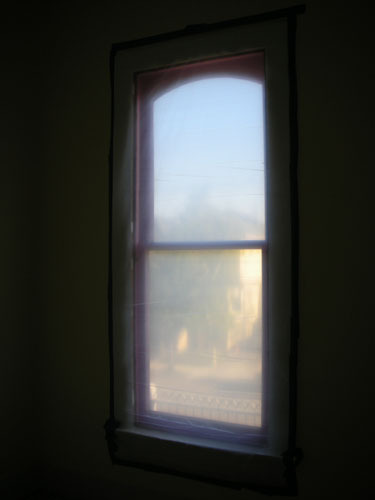 The room had two slit doors: one into the Accordion Room and one into the hall. 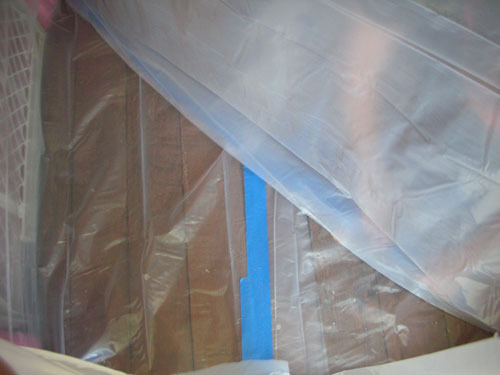 A slit door is made by cutting a slit in the plastic sheet, then taping a drape of plastic up to hang over it. It's a remarkably effective door, and easily made. 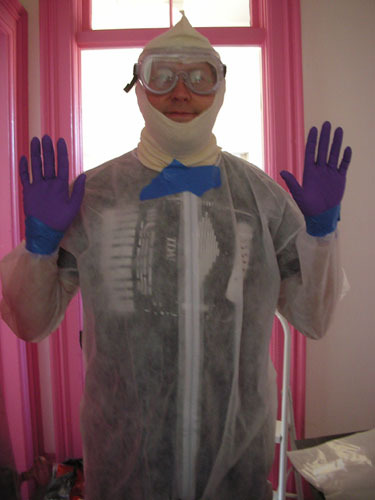 When the containment system was done, we suited up. 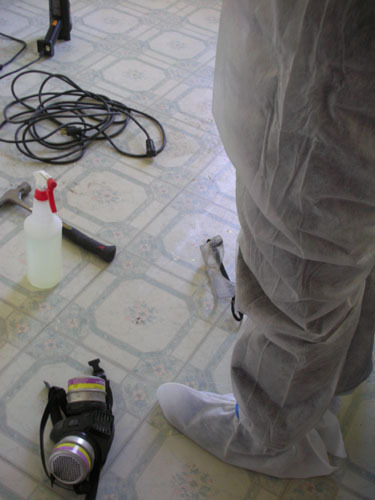 Coveralls, feet covers, head socks, gloves, goggles, and then respirators. 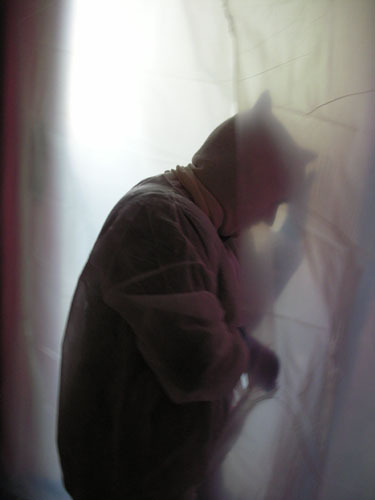 Here I am going into the room through the antechamber. It was very slippery. We came up with a very simple division of work. Noel operated the heat gun and did the main scraping, while I held the tile up to keep it from re-sticking to the floor, then stacked tiles and put them in the box. This was more involved than it sounds, because every surface quickly became sticky thanks to the assorted adhesives used to hold the two sets of tiles down in the first place. We started work at 11am, and things went fairly quickly, with only a few mishaps. When we get to doing the finishing on the floor, I'll discuss some of the mess we found under the first set of tiles (the asbestos ones). It's pretty nasty. After finishing work we sprayed things and each other down, bundled all the possibly contaminated materials up in plastic, and took this shot at almost 2pm. The floor has been stained dark reddish brown, and also has a coat of grey paint over it that's probably lead. It's been ineptly evened out (well, they tried, at least) with some kind of weird mastic which I have to send off to get tested. The whole thing is pretty sticky. But it no longer has stupid ugly tiles on it. Wow. I am SO glad I decided not to go down to the subfloor in my kitchen. I don't know what's under that underlayment, and I don't want to find out. Well, they do say that the best thing you can do with asbestos tile is just cover it up with a nice, sturdy surface. We did this because a) tile in the bedroom looks terrible, and b) it had not been installed properly, nor covered properly, and was right on the edge of being a Huge Problem. Of course, I keep thinking about the fact that half the rest of the floors in the house are covered in these stupid tiles, too, and may well be hiding the same mess. You two made amazing time on that job. 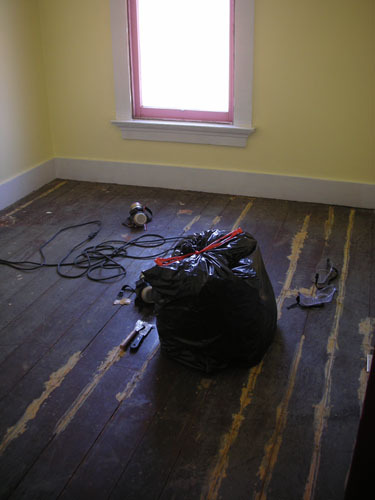 I have found that the two times we removed old nasty flooring, that the old house smell lessened dramatically. A lot of the old flooring is put down with horse hide glue and well over the years it ripens to a nasty smell. Both times the glue was reddish color. The room is looking great. Thanks, Jan. I think it look pretty good, too. Yeah, we worked as fast as possible because it was so incredibly uncomfortable. Every time we could have descended into bickering or just being lazy, the fact that we were increasing the amount of time to be spent in the bunny suits stopped us short. I don't think the old tile was put down with horsehide glue (though that would definitely make the house smell funny -- yikes); the glue it's stuck down to looks and acts like some kind of urethane. And the red stain is definitely a wood stain, under the gray floor paint (which is likely lead paint, to compound our toxic chemicals profile). One of the things that makes the house smell not so weird is removing the fake wood panels. That stuff has its own smell (it reminds me of my grandmother's house, which had that sort of paneling, too). We have only one more room with that stuff in it, and I can hardly wait. 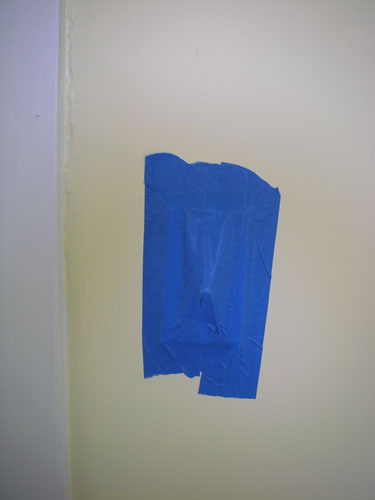 They had a mastic remover, last time I was at Home Depot, going to try it when we pull up the kitchen floor. The 1st layer of tile has a black mastic holding it down, probably from the 20's. I'm not sure we're going to need any special mastic remover. The stuff came off very cleanly with a heat gun, and there's not even that much of it on the floor. Mostly I'm planning to use a paint stripper to get up the floor paint and the stickiness. I can clearly see the grain of the wood, so there's not that much *stuff* to remove. But this all waits on getting the test results back on the sample. I am super impressed at all your hard work. I wonder if you made a land-speed record for flooring removed? I think I figured out that the only thing between my subfloor and the 1980s particleboard underlayment is tar paper, but I'm still glad I left it. They installed it properly, meaning 8d ring nails 5" OC. On the other hand, milling the thresholds to cover a 5/8" offset may kill me, or at least drive me insane. So that's a good reason to get in a bunny suit! 5/8"? Ouch. We have a lot of weird floor level changes in the house, many of them on the order of 5/8" or more. The transitions are... weird. Whoever built them did not spend much time dealing with milling or refining anything. As for the bunny suit option, it's not all that bad, although both of us were hobbling around complaining about our backs for a few days. Pulling up a subfloor laid with that kind of nailing schedule would be a lot more painful.